By Harry Dacres-Dixon in ECR Minerals (ECR) on 21st January 2019 . It is a sharp contrast to much of the past two years, when rising US interest rates, a strong dollar and buoyant equity markets hurt gold bugs and the shares of miners such as Barrick Gold, Newmont Mining and Goldcorp. And when there was a correction in US stocks in early 2018, the gold price failed to benefit. 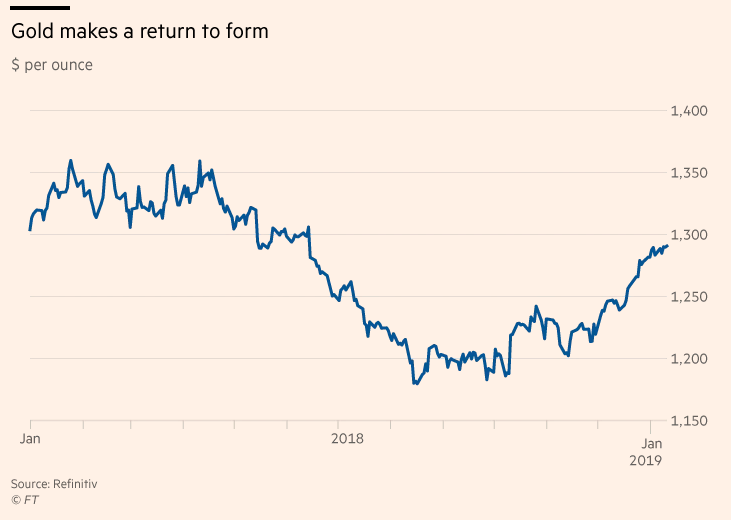 Almost a year on, the big question is whether 2019 could prove a profitable year to own gold, which is typically bought as hedge or haven by investors. The amount of physical gold in exchange traded funds has risen to 71.9m ounces, close to the record high of 72m touched in May 2018. “We haven’t seen flows like this since the first half of 2016 — when the gold market really took off,” says Joe Foster, a portfolio manager at VanEck in New York. Those flows, along with investors covering their bets against gold, have helped the yellow metal’s price recover from the 18-month low of below $1,200 a troy ounce touched last August. Analysts say there are a number of reasons to think the gold price can break through the $1,300 mark and push higher. 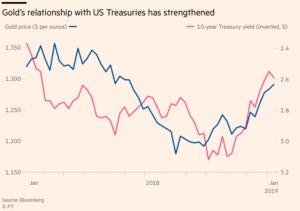 These include still-fragile stock markets, the expectation that the Federal Reserve will hold off from interest-rate increases this year, and a weaker dollar, which makes the metal more appealing. Rising US rates have been a drag on gold since the metal provides no yield. 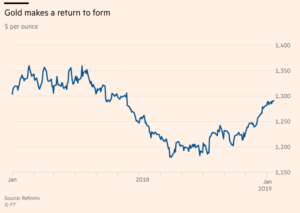 Goldman Sachs, one of the most influential banks in commodity markets, raised its gold forecast last week and now expects a gold price of $1,425 over the next year. Last week, Fitch Ratings warned that a continued government shutdown in the US could lead to a credit downgrade on the country’s debt, which is rated AAA by the agency. 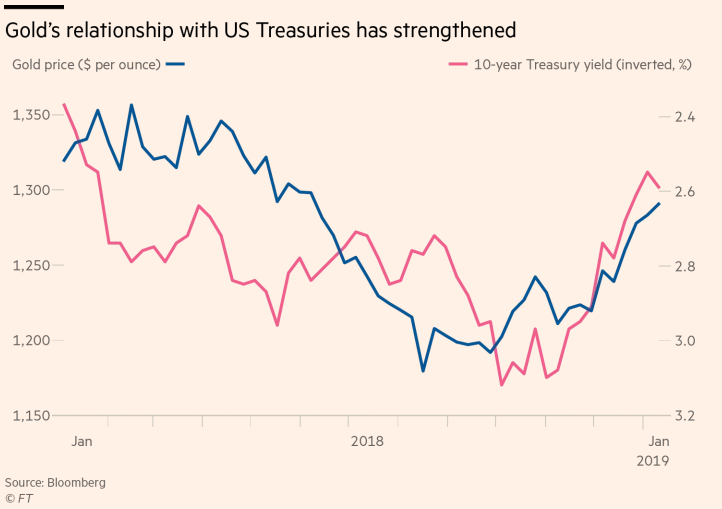 The buying of gold by central banks is also at its highest level since 2015, as many authorities remain keen to diversify away from the dollar. Standard Chartered estimates that central banks bought 500 tonnes of gold last year. China was among the buyers, adding almost 10 tonnes, following more than two years of unchanged holdings. “While Russia, Kazakhstan and Turkey dominate central bank purchases, a host of other central banks entered the official sector gold market last year,” says James Steel, chief precious metals analyst at HSBC. Mr Steel notes that the list includes Hungary, which had been out of the gold market for decades, with the exception of modest purchases in 2017. The central bank of Poland also purchased gold for the first time in many years, he adds. However, the multiple disappointments for gold bulls over the past year leave some wary. Gold has not breached the $1,300 level since June. While ETF holdings have risen to their highest level in five years, traders in the futures markets have not yet placed significant bets on higher prices, according to ICBC Standard Bank, a unit of China’s largest lender. “On the one hand this does present an opportunity for gold prices to move higher still, if investor length now comes into the market,” says ICBC analyst Marcus Garvey.